If your dash length appears fine in ModelSpace but not correctly in some viewports, don’t forget about the PSLTSCALE system variable setting. If you have viewports at different scales on one Layout Tab, or some details in PaperSpace and some scaled viewports on the same Layout, you’ll want a PSLTSCALE setting of 1 and then your LTSCALE will need to change to either 1 or .5 based on your office standards. This SysVar needs to be set in each Layout Tab – it isn’t a global system variable. There are LISP routines available to help manage drawings with many layouts if you need to switch them over en masse. Also, if you have the habit of “drawing through the viewport” into ModelSpace from PaperSpace on a Layout Tab, make sure you didn’t actually draw your linework in PaperSpace when you thought you drew it in ModelSpace. Your dashes will appear continuous when all your other settings are correct. Additionally, check your MSLTSCALE system variable setting (0 vs 1). This SysVar controls the scaling of linetypes in ModelSpace based on the annotation scale. I draw in model space and plot in paper space. I want to see the lines in model space as they will appear in paperspace – the ‘ole “what you see is what you get”. My drawing in model space may contain several drawings, each to be plotted at a different scale. Here is how I handle my linetypes. 1. 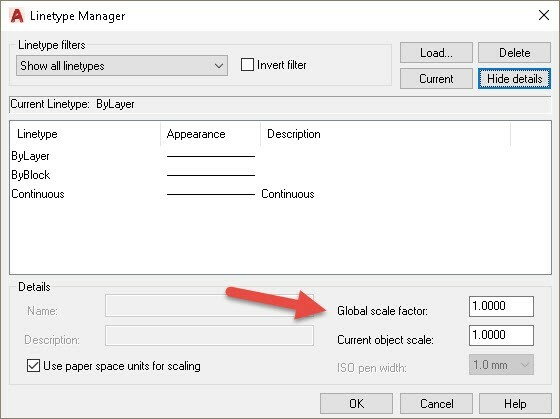 I go to the linetype manager (LT) and uncheck the box that says “Use paper space units for scaling.” I change the global scale factor to a number that is 1/2 of the plot scale factor for the main drawing. For example, if my main drawing is a floor plan, which will plot at 1/4″ = 1′-0″, I set the global scale factor to 1/2 x 48 = 24. Here, 48 is the scale factor for 1/4″ scale: 4 x 12 = 48. 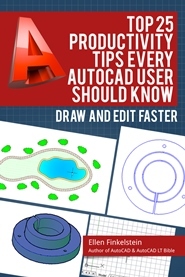 Why AutoCad does it this way is beyond me, but that’s how it works. It’s always been that way. 3. I start drawing the detail. When I make the first dashed line – or anything but a “continuous” line – initially it will appear solid. To scale it: I open the properties windows and, with the line selected, I change the scale factor to – guess what? .33! To get that number I take the linetype scale that the drawing is set to – which remember is 24 and I divide that number into my new detail scale of 8. 8/24 = .33 Wala! 4. Make a viewport in paperspace for each detail, scale them as discussed and the lines will look exactly the same. You may not want them to look the same and so you will need to make adjustments, but that gives you a starting point. 5. You will need to regenerate the drawing to get the linetype to show up properly – at least I always do. Patricia, wow that’s a lot of work — and calculations! Thanks for sharing your process. I draw pavement marking plans, typically at scales ranging from 1”=10’ to 1”=40’. I’ve created linetypes with 1:1 definitions for pavement marking patterns, i.e. 10,-30 for a 10 foot stripe and 30 foot gap. What I’ve done for years is set the individual linetype scales of the pavement marking entities to 1/(drawing Ltscale) and set PSltscale and Msltscale to 0. This gives me the result I want – the pavement markings show up with the correct stripe and gap lengths. It’s basically the opposite of Autocad linetype scaling, giving consistent scaled measurements regardless of plan scale. If I need to work at multiple viewport scales in a single drawing I typically set the drawing Ltscale to 20, regardless of the different actual scales being used; then set the linetype scale of the individual pavement marking entities to 0.05 (1/20). Now I’m working as a sub to another consultant that uses annotative scales, and they want my drawings to display properly when Ltscale, PSltscale and Msltscale are all 1. I can get it to work for a drawing where everything will be plotted at the same scale. But I can’t get the linetypes to look consistent in one drawing that has multiple viewports at different scales. 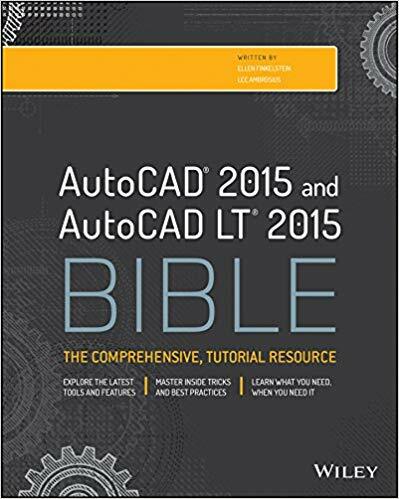 Is there any other way to handle this, built into autocad? For example a Ltscale setting that would be 1/(annotationnscale), so it would be dynamic for different annotative scales? I thought the purpose of PS is to essentially show how it will plot, minus layer colors etc. I cannot understand why the line type scale of my property line is allowed to display one way in PS and plot entirely differently. Autodesk has made this entire line/celt/ps scaling issue MUCH too complicated. Any insight would be appreciated.